Maintaining your lawn’s health and appearance requires that it receives plenty of sunlight and nutrients. Feeding, watering, and mowing your lawn are all necessary for proper lawn maintenance. But if your lawn’s soil is too heavily compacted, all of that vital energy and nutrition cannot reach the soil, and your lawn will not thrive. Aeration is the process of perforating your lawn’s soil in order to allow for more water, air, and nutrients to make their way into it. The number one goal of lawn aeration in Idaho Falls is the alleviation of compact soil, which prevents the circulation of water and air, and thus starves your lawn of the vital nutrients it requires. Aeration also involves getting rid of thatch (grass that has become overly matted and clumped together) so that your lawn can breathe. Our Idaho Falls aeration services will also help your grass’s roots grow deeper into the soil for a stronger, more vibrant lawn. Your lawn dries out and turns brown too easily, which is a good indicator of excess thatch. A thatch layer that is thicker than one-half inch requires immediate dethatching and aeration. Your lawn looks patchy, thin, and bare. Water puddles on the lawn after it rains. It is difficult to stick a pencil or screwdriver into the soil. Vehicles drive over your lawn excessively, or it is otherwise heavily used. This is a large contributor to soil compaction. Your lawn was established with sod, which often leads to heavily compacted soil. Laying sod necessarily involves soil layering, as the soil underneath the sod is laid on top of the pre-existing soil on your property. Aeration will help loosen up this compact soil. 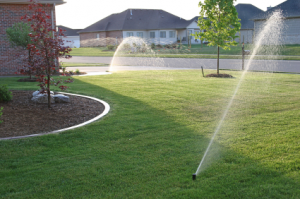 Idaho Falls aeration works best when the soil is moist, so we recommend watering your lawn consistently a day or two prior to having it aerated. However, it is also important not to over-water it. A lawn that is too wet will cause just as many problems as a lawn that is too dry. 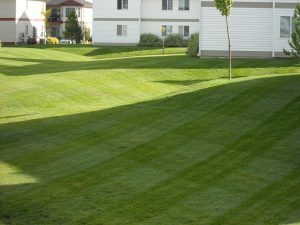 Another thing to consider is that one of the best times for lawn fertilization in Idaho Falls is just after lawn aeration. This is another service that we provide and would be a wise investment proceeding our aeration services. Our technicians know how to properly aerate your lawn and bring it back to its full potential. When you hire New Leaf Landscape Design & Maintenance, you can expect to have a better looking lawn in no time. While the aeration process itself may only take a two-three hours, results may take up to a couple of weeks depending on the size of your lawn and the consistency of maintenance thereafter. New Leaf Landscape Design & Maintenance is happy to provide quality Idaho Falls aeration, knowing that your lawn is an essential part of making your property a place that feels like home.